The highly acclaimed international exhibition, “Lawyers Without Rights: Jewish Lawyers in Germany under the Third Reich,” will be on view in York University’s Osgoode Hall Law School Library from Monday, Nov. 9 through Sunday, Nov. 22. Hours: Monday-Thursday, 8am–10pm; Friday, 8am–5pm; Saturday-Sunday, 10am–6pm. The exhibition is sponsored by the Jack and Mae Nathanson Centre on Transnational Human Rights, Crime and Security at Osgoode Hall Law School in conjunction with the American Bar Association and German Federal Bar. The exhibition has been shown in nearly 100 cities in Germany, the United States and others parts of the world. “As important as it is to our everyday lives as a bulwark against arbitrary governance, the rule of law can never be taken for granted,” said Associate Professor and Nathanson Director François Tanguay-Renaud. 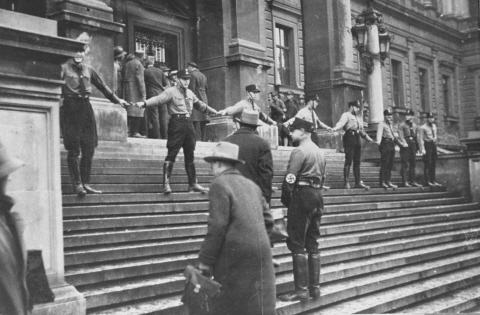 “This exhibition – focusing on an insufficiently known aspect of the Third Reich – constitutes a vibrant historical testament to the importance of lawyers in holding governments to account, and the grave threats to social organization that inevitably follow when their role is undermined. Given Osgoode's core mission to educate tomorrow's lawyers and, through bodies like the Nathanson Centre, generate cutting-edge research about their responsibilities and predicaments at home and abroad, 'Lawyers without Rights' serves as a forceful, eye-opening reminder of what we stand for, and stand against." The idea for the exhibition was conceived in 1998 when an Israeli lawyer asked the regional bar of Berlin for a list of Jewish lawyers whose licenses had been revoked by the Nazi regime. After the Berlin bar transformed its research into an exhibition, other regional bars began asking whether they could show it and add their own research. “So, like a puzzle, a portrait of the fate of Jewish lawyers in Germany has emerged step by step,” Filges said. The exhibition is currently touring North America. After Osgoode, the exhibition goes to the Buffalo & Erie County Public Library for three weeks. In addition, the exhibition has been translated into Hebrew and opens on November 29 in Jerusalem at the Israeli Supreme Court.